I am publicly turning in my FPP homework assignment. I would like to think I purposely make dumb FPP mistakes so the newer members are less intimidated to post. However, thank you rouftop for pointing out the obvious also everyone who applauded him. Healthy MeFites are Happy MeFites! The Times is tightening the rules. Earlier this year there was a discussion of links to the NYT in which the fact that links from Metafilter were exempted from the paywall was given as a reason not to treat these links specially. Such links are no longer exempted. Can we please start treating these as we do links to any other subscription-only source? We're all still products being sold. But now we're pigs. Just over a year ago, blue_beetle commented that "If you are not paying for it, you're not the customer; you're the product being sold." This made the rounds for a bit, as people recognized the truth in it. (Previously and previously on MeTa) Today, his comment has been featured -- without attribution -- on a "demotivational poster" comparing Facebook users to pigs. Metafilter would look so pretty with MathML! Is there any interest in allowing MathML in posts and comments? We could use MathJax on another site like mathoverflow.net to convert a readable LaTeX equation into a MathML for the comment here. Did you know there will be a whole year of political drama coming up? Send me sent MeFi Mails? I've been away for a couple of days, so I just noticed the text shadow on the preview/post buttons. I gotta say: They look ballin'! 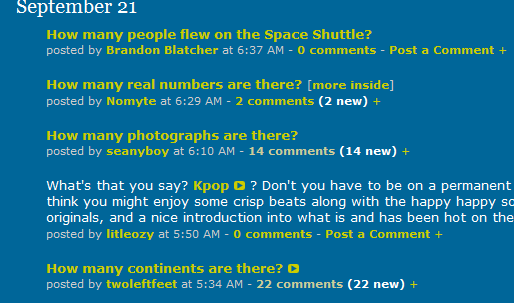 Keep the tasteful modernization of MetaFilter going! As I was listening to some new music on Spotify I was remembering the fun I've had listening to recommended tracks by MeFi listeners, especially the Christmas tracks. Has anyone created a shared playlist/collaborative playlist with MeFi contributors? Should this be AskMe? This thread was deleted with the reason being "let's not". That reason is obtuse and may be difficult for some people to understand. Could we have a clear explanation of why the thread was deleted, please? On the blue, people occasionally post links to repositories of images of one kind or another. Has anyone amassed a collection of these? How do you interpret all this? Then is a close thread a close thread? Naoto Ōshima, designer of such classic games as Jah, Eggmon pops into a thread to drop some history and Easter Eggs. The founder of Byliner stopped by to comment in this thread. Welcome new MeFite Philip Nel, one of the editors of "Tales for Little Rebels," who showed up in yesterday's thread about favorite childhood tales written by radical lefties. He also kindly provided this bibliography from “Radical Children’s Literature Now!,” a lecture he and Julia Mickenberg gave at the Children’s Literature Association Conference earlier this summer. I find myself thinking of questions I want to ask when it's been only 5, 7, 9 days from my last question. Then day 10 rolls around and I can't remember what it was. Then something else comes up, and I ask a question about it, and like clockwork the next day I remember what that VERY IMPORTANT (but not urgent) question I want to ask was. Would it be possible for us to save a draft of a question or of multiple questions while we are working on them/formulating our thoughts/waiting for the clock to run out? That can't be. That's inside the thread. The producer of the Fela Soul mashup album is now a MeFite! Metafilter forums going on for miles and miles gets a brief mention on the Jeff Rubin Jeff Rubin Podcast as Rubin interviews the guys from Everything is Terrible. Though I'm not sure which of the many EIT threads they mean. The mention is 25 minutes into it. Try and believe, I thought I'd show you / The way tomorrow, please just peek at the ground . Within the last year, there was a post on the blue that had a video of a (British?) guy giving a lecture where he played a song backwards (maybe a Led Zeppelin song?) and it sounded like gibberish and then he played it again, but with lyrics on the screen to influence your mind to hear what was "really" being said. Could you help me find this? languagehat: "my work here is done"
Mr. Fireman, bet you couldn't put me out if you tried. Using this to get Hoder freed? Like high school but more prolix. I believe the consensus last time was "Give 'Em Hell"
I'm already sad, the commercialism is just making things worse. MeFite John Isner is playing well at the U.S. Open. He just took the third set from Andy Murray with a 139 mph ace. Murray is up 2 sets to 1, but I would love to see Isner win this match. How about you guys? Let's cheer him on. My RSS reader says the MetaFilter RSS feed is invalid. I'd really like to use it because I've become RSS oriented and I'm not checking MeFi. It could be a problem with the RSS reader, Thunderbird 2.0.24 (I know there are other readers, but TB uniquely meets my needs), but the MeFi feed has worked previously and the AskMefi RSS feed works currently. I've tried the feeds coming from the feed.feedburner.com host and the one from feed2.. Thanks in advance. Attention all MeFi soccer/football enthusiasts: If you're not already fantasy leagued out, the MeFi UEFA Champions' League Fantasy League is renewed for the 2011/2012 season. League code is 46760-8861. Hurry! First matches and scoring starts September 13, 2011. Today is one of the great Metafilter holidays. Happy Jessamyn Day, everyone! Especially to Jessamyn! It's dune and over with. I liked the Waffle House post. Regarding this post, which was deleted. "This is the sort of thing you need to write a more MeFi-like post for." Well, considering that the text of the headline I used is very similar -- if anything, less graphic -- than the headline of the article I linked to, with much of the text is taken verbatim from the memo, with additional information accurately presented, can I get a clarification on how this isn't written in a Me-fi enough way, please?! "One day I told him I thought the world should have a book of everything he knows."